The Every Student Succeeds Act (ESSA) explicitly recognizes that feeling safe and supported are necessary conditions for students to learn and achieve. The new federal law provides multiple opportunities to create these conditions by implementing comprehensive school safety measures that balance physical and psychological safety. Too often schools opt for single programs or a piece of security equipment as a quick fix and ignore the far more effective and sustainable comprehensive strategies that support both safety and learning. School psychologists have relevant expertise and can provide a leadership voice to help state and local district leaders establish effective measures across the school safety continuum. This ranges from promoting positive school climates, violence prevention efforts, and trauma sensitive practices to conducting threat assessment and crisis preparedness, intervention, and recovery efforts. 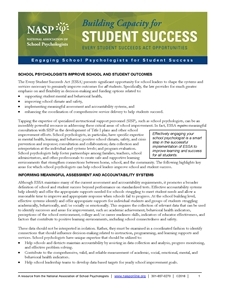 Importantly, school psychologists can help integrate school safety with ongoing positive behavior, social–emotional learning, effective discipline, and school mental health services. Provide professional development: to improve understanding of how to support children impacted by trauma. Implement evidence-based policy and practices to prevent bullying and harassment. Improve coordination and collaboration with community agencies in efforts to prevent violence and improve school safety. Develop, implement, and evaluate policies and practices that promote safe school environments for all students. Develop and lead crisis prevention and response policy and practices at the district and school levels, including regular practice and review of safety plans. Provide education for students, staff, and parents on the symptoms, warning signs, and risk factors of depression and youth suicide. Conduct risk assessments (e.g., suicide and threat assessment), implement intervention procedures, and provide resources for students, staff, and families in need. Create a trauma-sensitive school environment that is responsive to the needs of the children and youth who have experienced stress, adversity, or trauma at home or in the community. Serve as part of a crisis intervention team to assist with the recovery of students and staff after a crisis. With research informed training, school psychologist help evaluate the psychological trauma risk, provide appropriate short- and long-term interventions and respond to demonstrated psychological needs of those impacted by a crisis. Assist in measuring and interpreting school climate and safety data, and using those data to set annual goals. Foster effective collaboration with law enforcement, fire and rescue, outside mental health agencies, and cultural liaisons to improve coordination and efficient response and recovery. View additional details and contact information for various stakeholder groups. 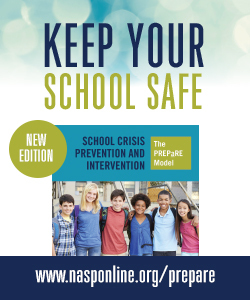 This handout provides an overview of school safety in ESSA's provisions relevant to school psychologists. View the companion handout for decision-makers.